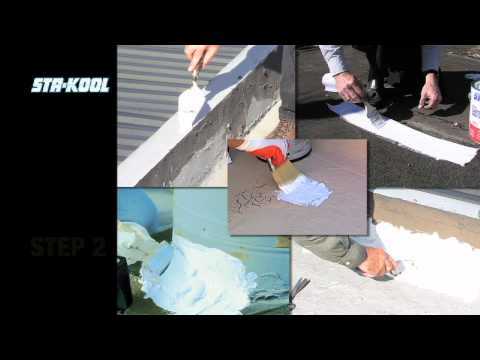 Sta-Kool® 805 Metal-X is a tough, white elastomeric roof coating that is formulated for exceptional bonding strength to metal roof surfaces. This high performance product also contains rust inhibitors, which provide long-term protection to metal surfaces. Metal-X expands and contracts with the roof’s movement to resist cracking and peeling. The bright white finish keeps metal roofs cooler by an average of 50 degrees compared to uncoated metal, thus minimizing heat stress associated when metal roofs expand under the hot sun. Metal-X provides a protective barrier that reflects, seals, and protects from the elements. In turn, this provides a longer life to metal surfaces, helps to cool surfaces and will help reduce interior temperatures. This environmentally advanced formula helps reduce energy cooling demand, is low odor, and low VOC, making it a great choice for your metal roof. SK-8055 5 gal 12" x 12" x 14.75"